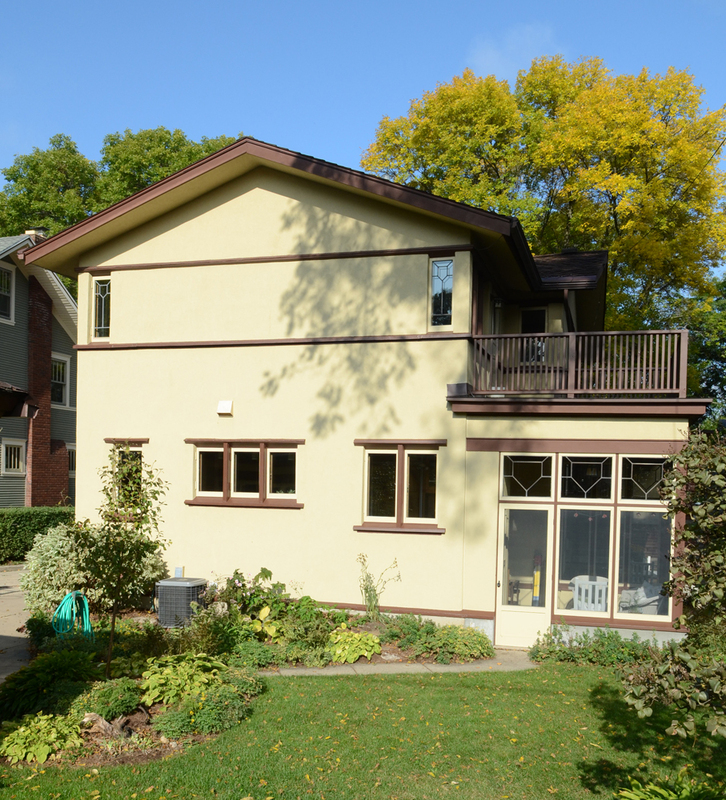 A press event Tuesday October 6, 2015 sponsored by Frank Lloyd Wright Wisconsin announces the documentation of the house at 2107 West Lawn Avenue in Madison as another one of Wright’s American System-Built houses. 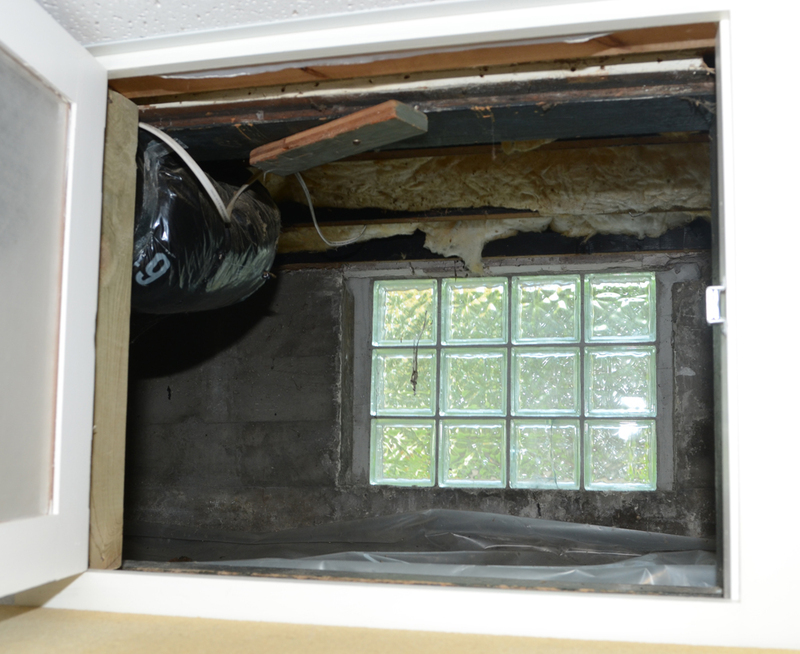 This is the second discovery of a newly documented Wright ASBH home this year. The other is in Shorewood, a suburb of Milwaukee. The house is an ASBH Series AA model. 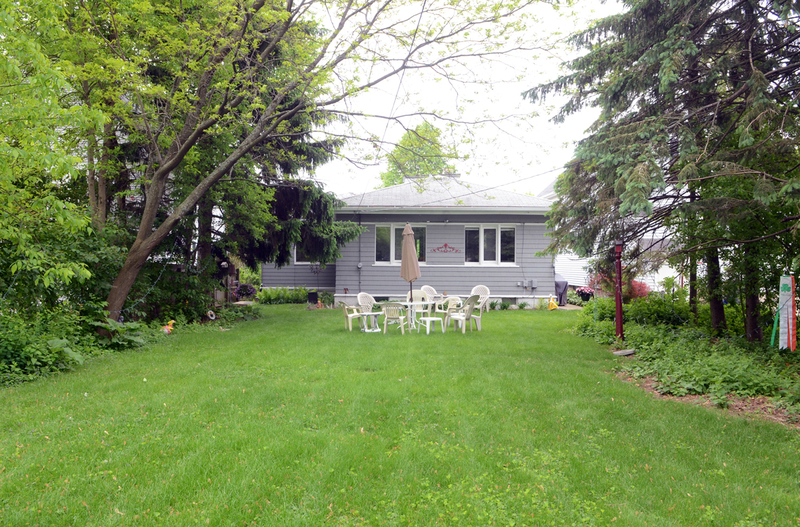 Linda McQuillen purchased the house in 1989. The entry is on the left side, as visitors approach the house. 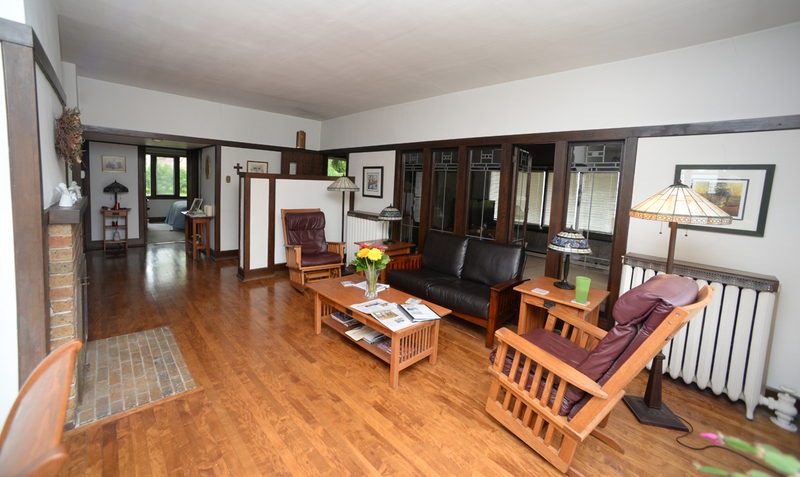 The porch to the left and the room to the right (built as an open porch, enclosed by a subsequent owner) are 1924 and 1927 non-Wright additions. 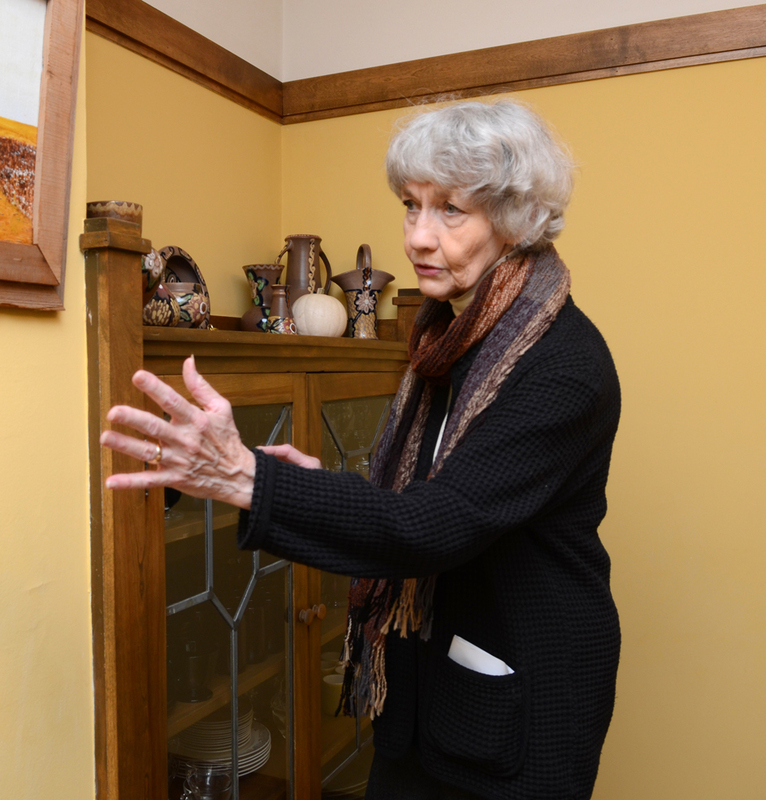 The house was painstakingly documented by Madison-based Wright scholar Mary Jane Hamilton over two decades with assistance from many sources, including Mike Lilek. 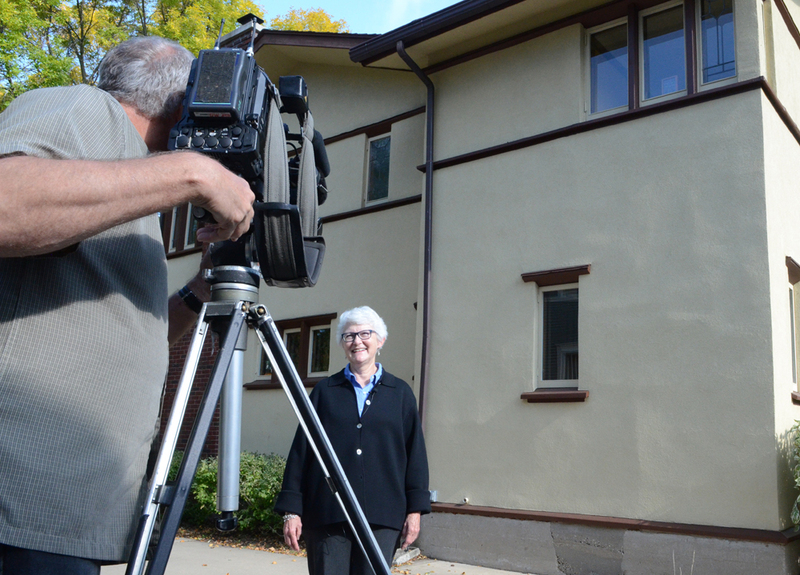 Lilek has overseen the restoration of Wright in Wisconsin’s ASBH properties on W. Burnham Street in Milwaukee and led the documentation of the Shorewood house with the assistance of other Wright scholars. Hamilton chats with Nathan McQuillen, who grew up in the house. Her meticulous documentation was displayed on four poster boards on easels. 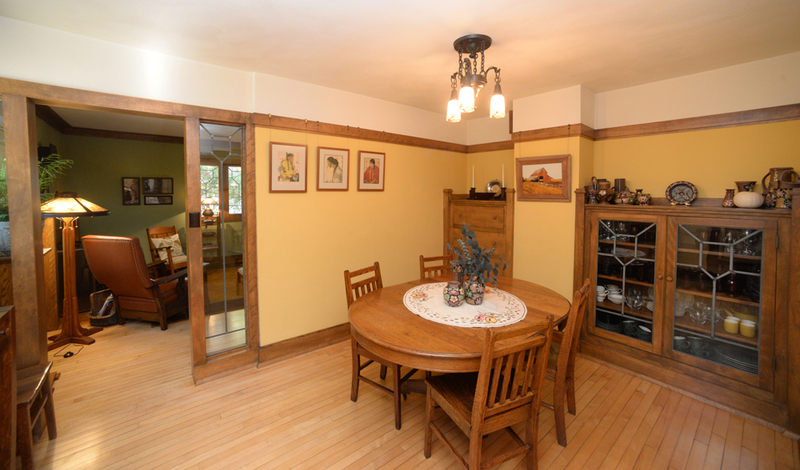 Hamilton explains that only the right hand built-in hutch in the diminutive dining room is original. 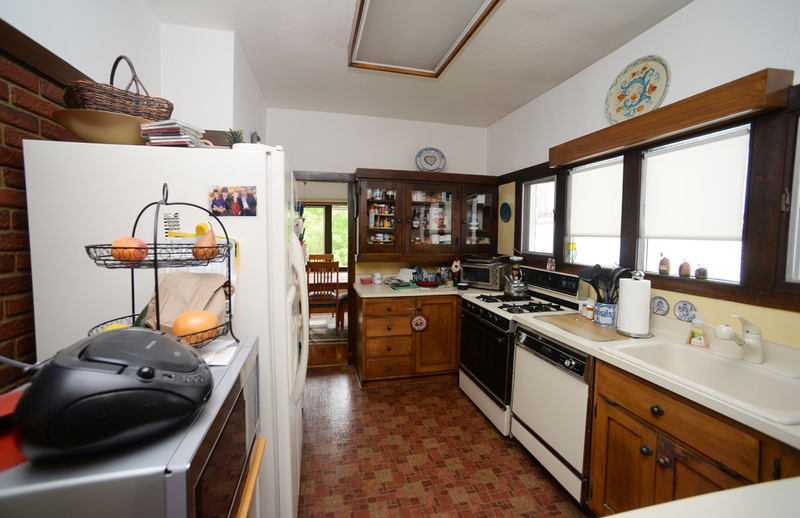 The room was originally the kitchen. 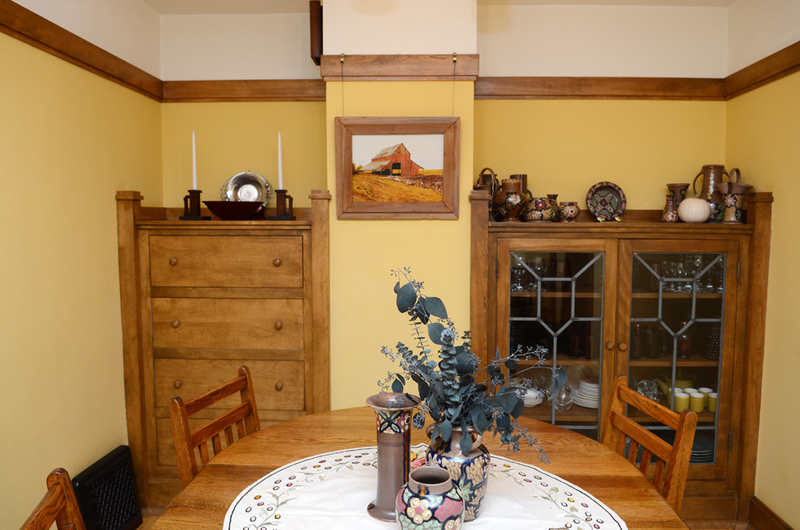 The hutch at left is in place of an original door. 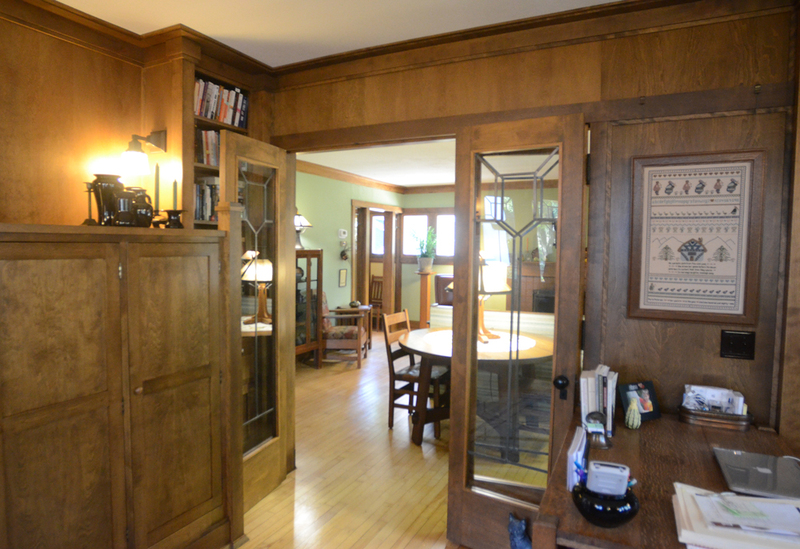 The original hutch has doors with the same leaded-glass pentagon seen in many windows of the house. 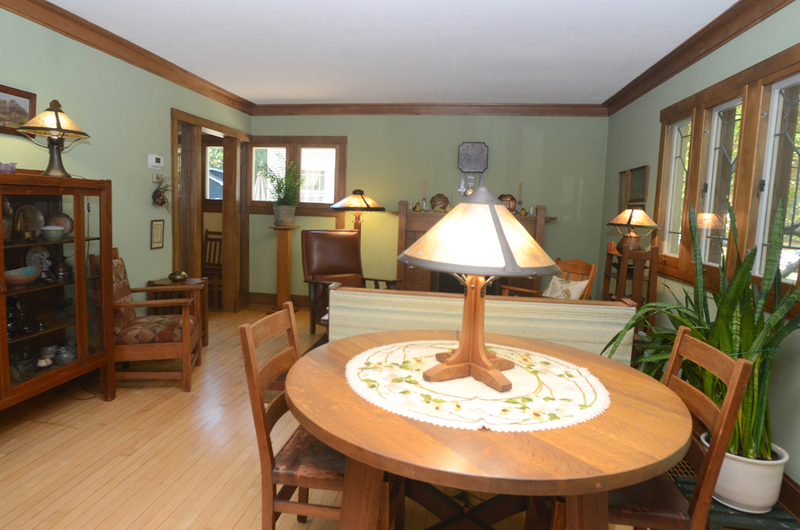 The dining room leads to the living room. 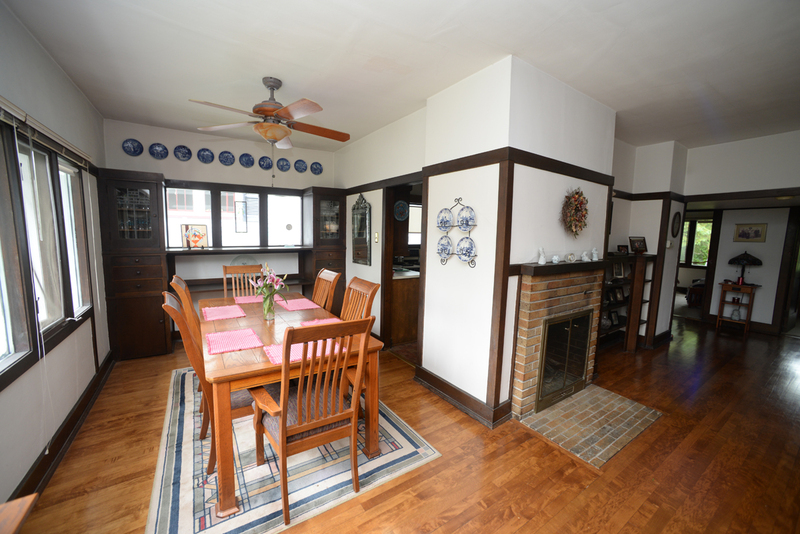 The fireplace at the left side of the living room is not original. 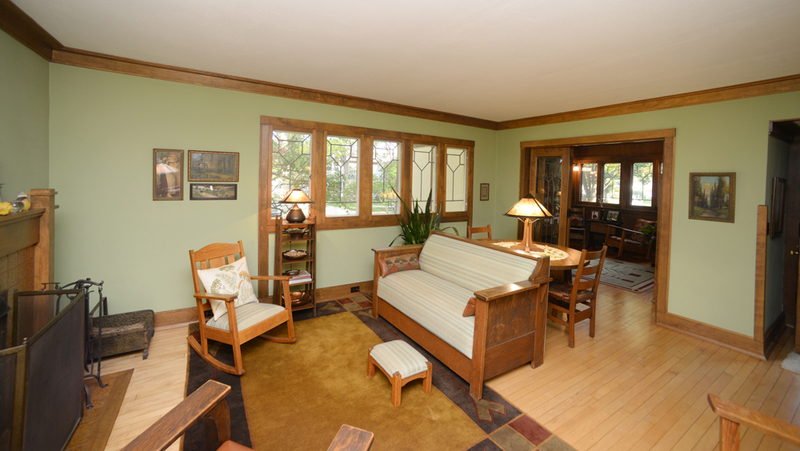 The sun room from one of the 1920s additions is now an office, south of the living room. 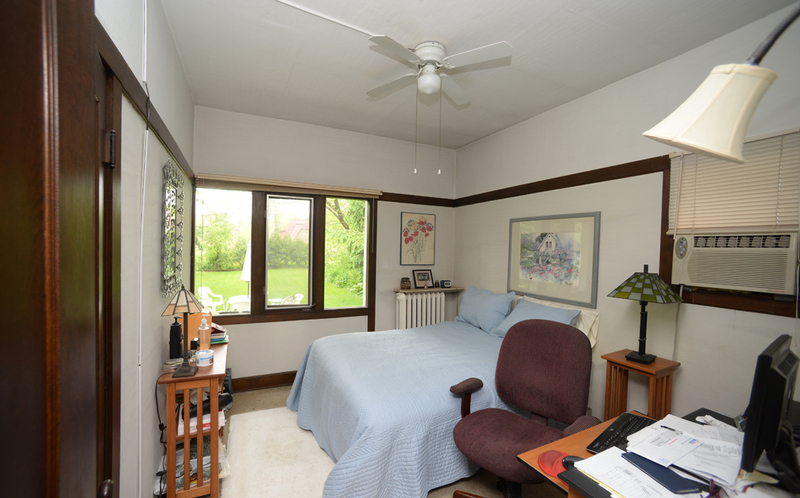 A basement crawl space below the addition shows the original and added foundation walls. 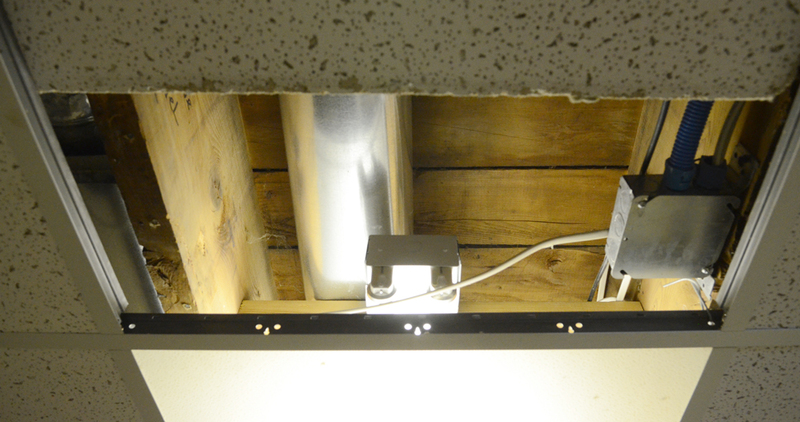 Part of the authentication of the house as ASBH comes from the joists being 24″ apart, as was customary in the ASBH homes, as opposed the conventional 16″ measurement. 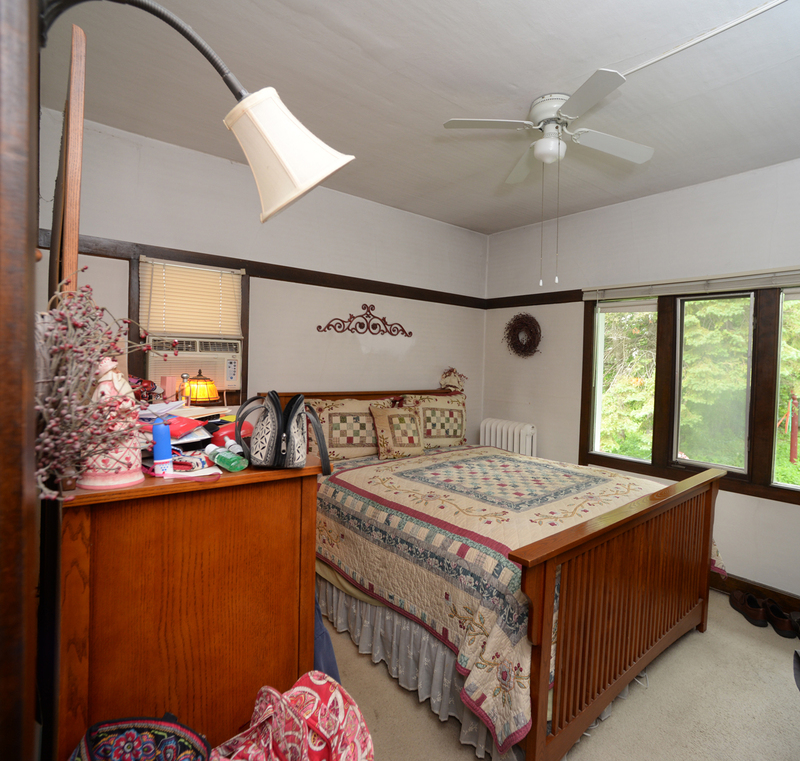 There are three bedrooms upstairs. 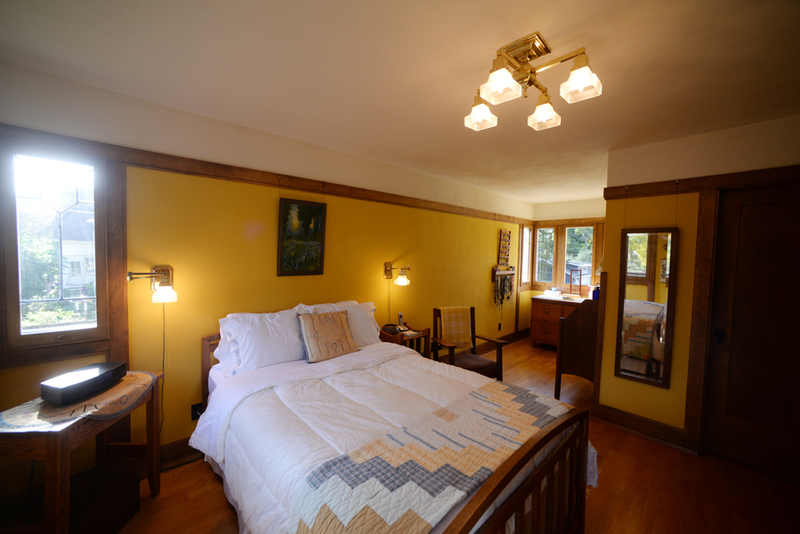 Two are shown in their entirety, the third is depicted by the narrow broom closet. 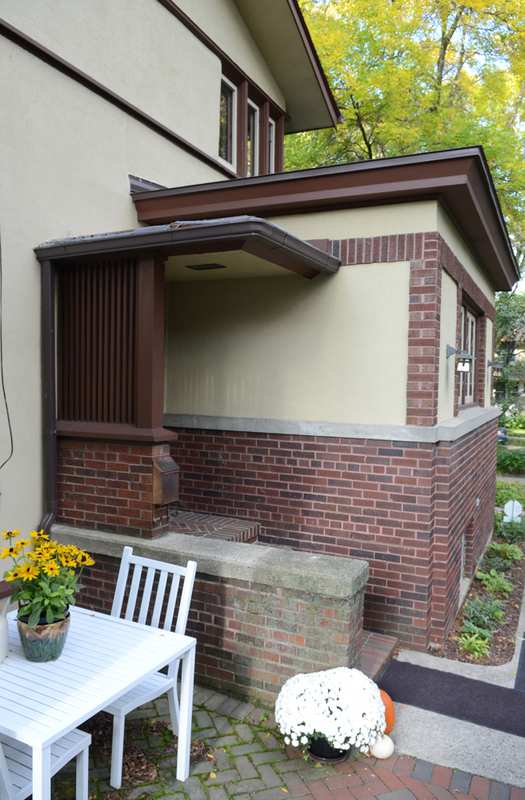 The entrance to the house, on the south side, away from the street, has one of Wright’s characteristic wood screens outside the door. The front door knob and lock are original to the house. The north (left) and east sides of the house. The fireplace is a recent addition. The street is to the left. 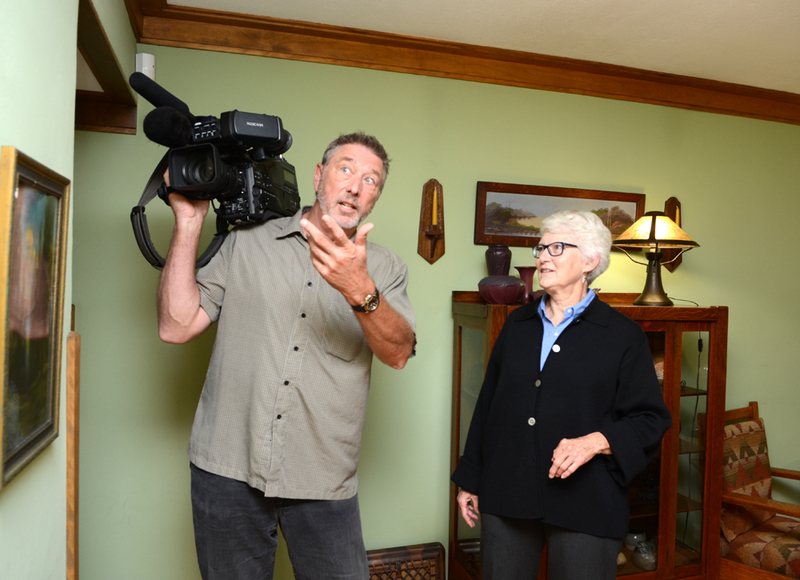 McQuillen is interviewed by journalist Doug Wahl of Madison’s Channel 3 television station. 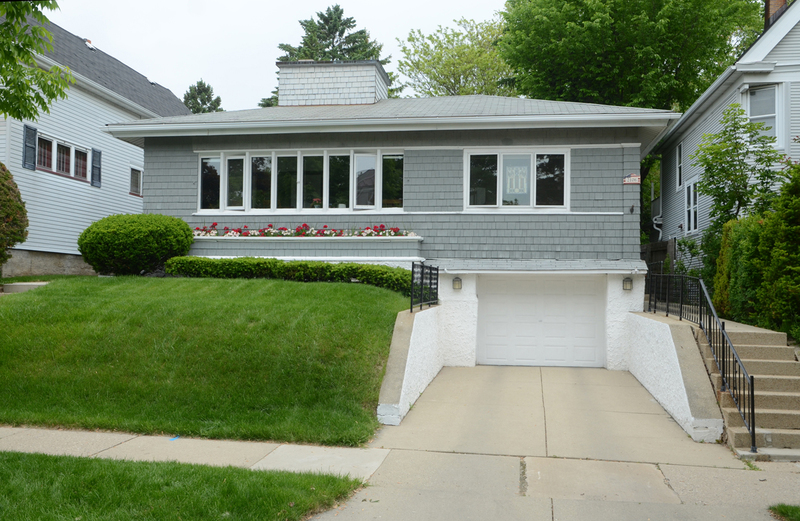 The 2100 block of Newton Avenue in Shorewood, Wis., will no longer be a quiet street, as word spreads of the documentation there of a previously unidentified house designed by Frank Lloyd Wright. 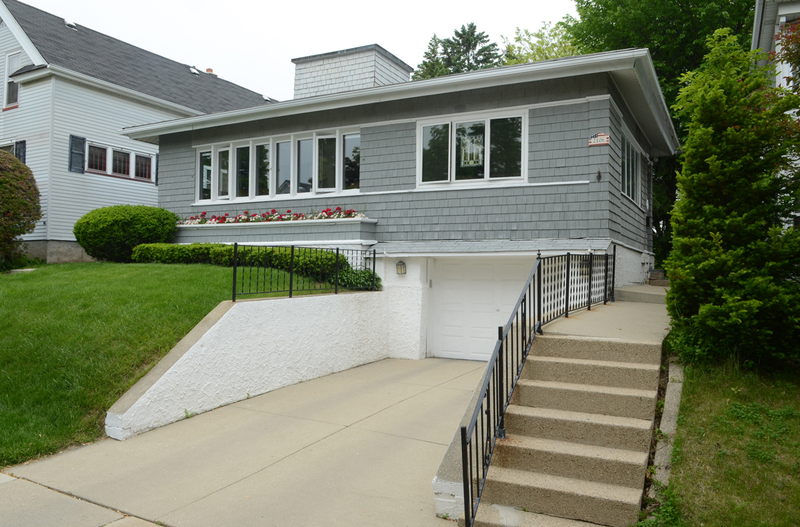 The home at 2106 Newton may not look like a Wright home at first glance, but underneath the modern siding, and above the garage which was added in 1976, is one of Wright’s stucco American System-Built homes. 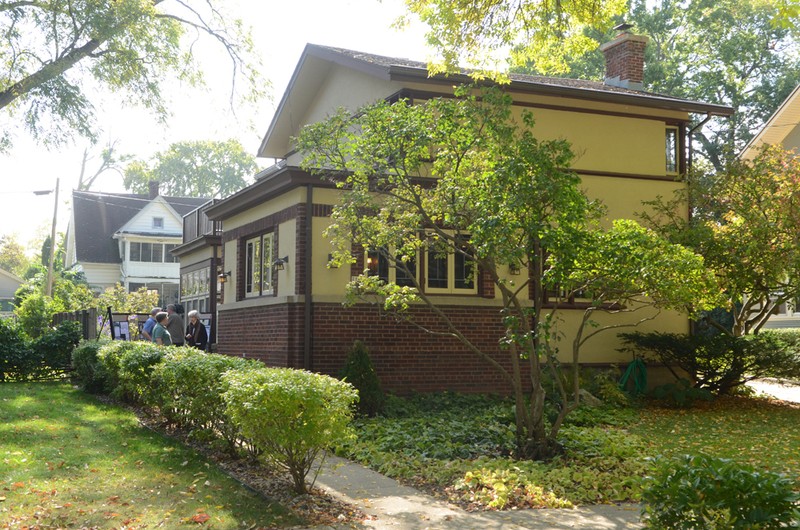 Many people think Wright designed homes only for wealthy clients, but he was keenly interested in affordable housing for the middle class. The American System-Built homes, designed as affordable housing, could be selected from a myriad of designs. The entrance to the house is on the right side (as one faces the house). 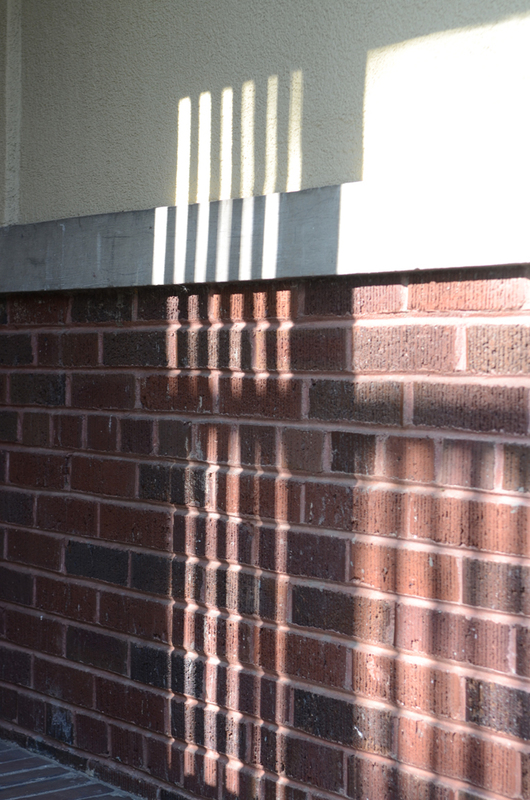 The original open porch at the entrance was enclosed at an unknown date. 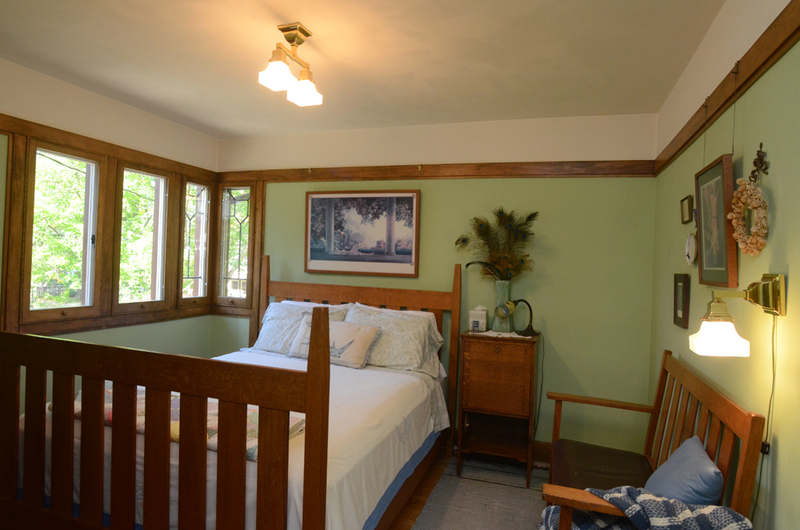 It still has the original stucco finish and the leaded glass windows which apparently were the front windows of the house. 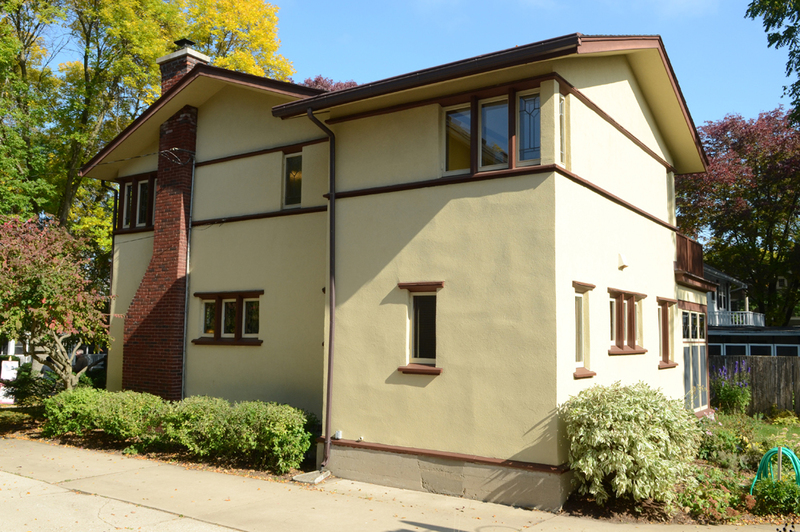 The Newton Avenue house, built in 1917, joins six homes in the 2700 block of W. Burnham St. (two single-family homes and four duplexes) as examples of Wright’s American System-Built homes in the Milwaukee area. 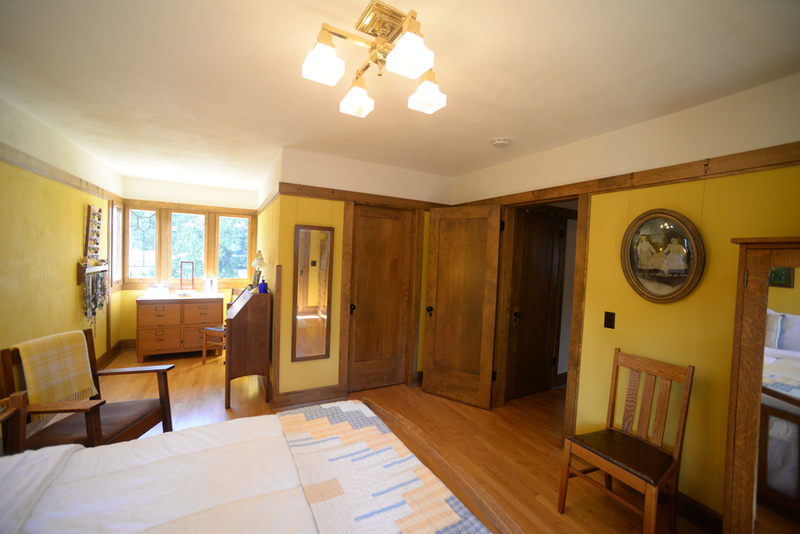 The two-bedroom Shorewood house is a Model A203. Four other Milwaukee American System-Built duplexes, the Arthur R. Munkwitz Duplex Apartments, were demolished in 1973 to widen a street. 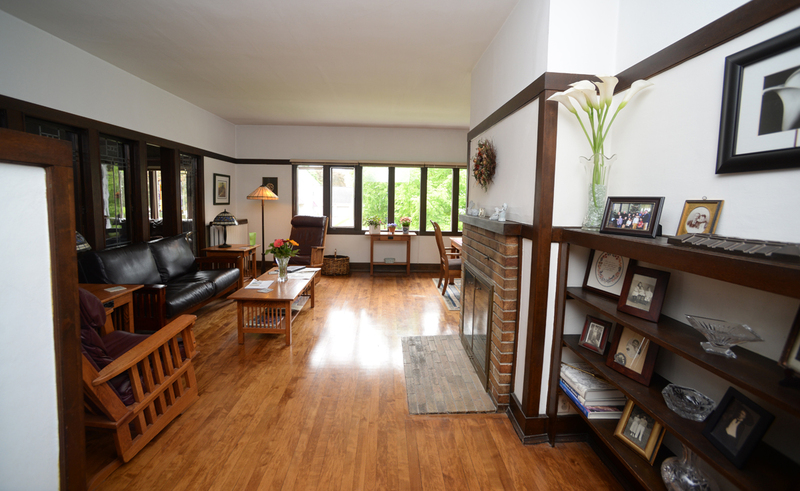 The first person to tell owners Roger and Pat Wisialowski that they may be living in a Wright home was the late Richard Johnson of Evanston, Illinois. 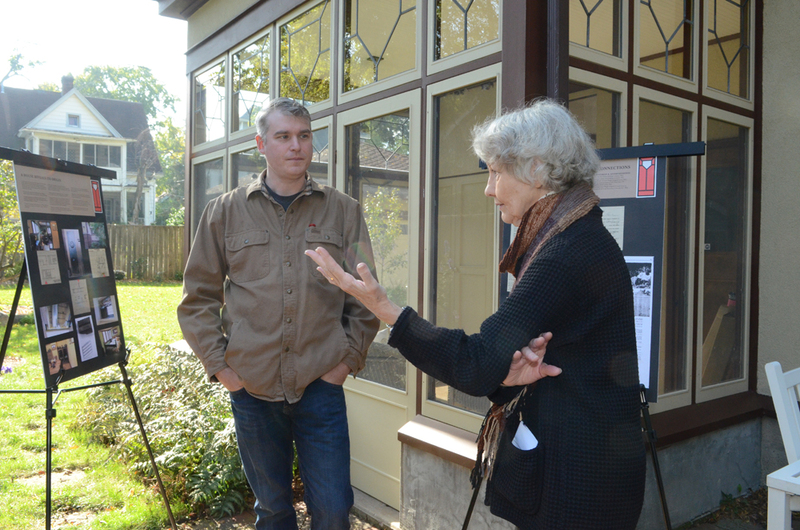 Johnson had a passion for searching for previously unknown Wright works. 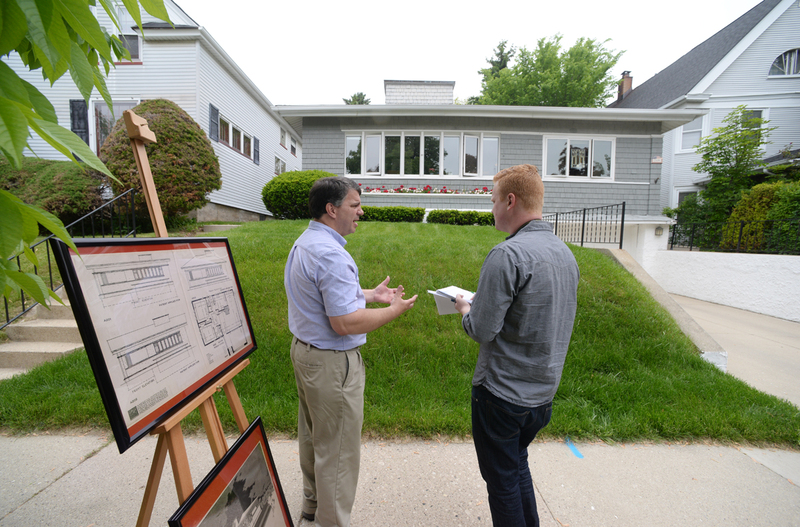 However, none of the ones he believed Wright designed were documented and authenticated as Wright’s, until Mike Lilek researched the little house on Newton Avenue over the last year and found proof that it is, indeed, a Wright home. 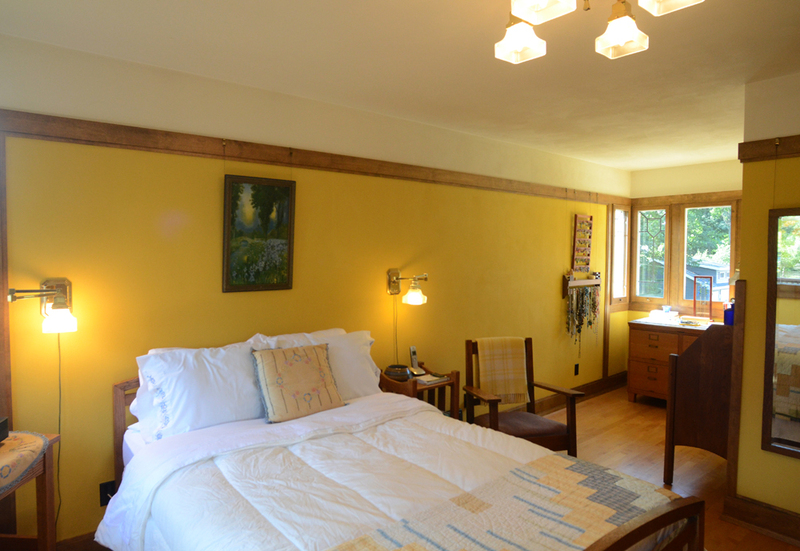 Lilek is nationally recognized as an expert on the subject of Wright’s American System-Built homes. Lilek, left, is interviewed by Jeff Rummage of the “Shorewood Now news site.